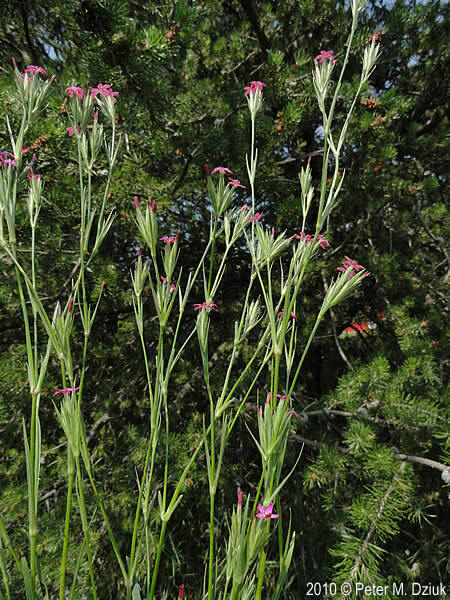 Dianthus armeria plants in bloom. 2010 © Peter M. Dziuk. Minnesota Wildflowers. minnesotawildflowers.info (Accessed 2/2018). 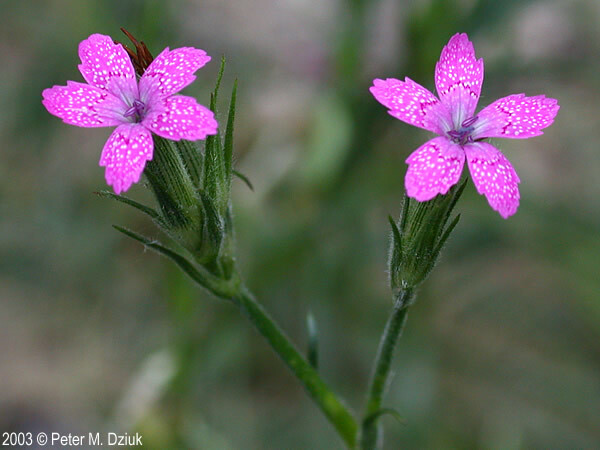 Dianthus armeria is an annual or biennial herb, 20-60 cm tall, slender, stiffly few-branched, nodes swollen. 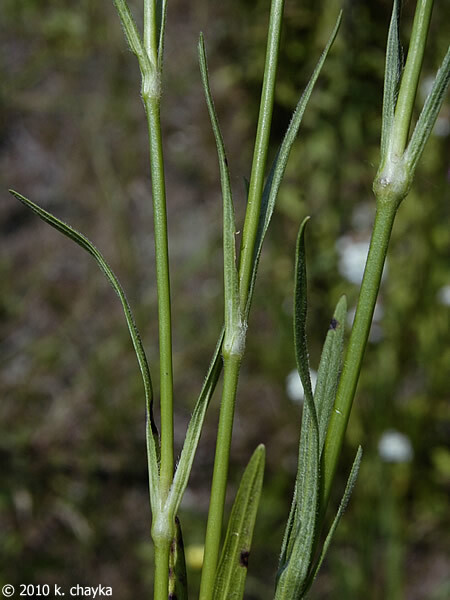 Dianthus armeria leaves. © 2010 k. chayka. Minnesota Wildflowers. minnesotawildflowers.info (Accessed 2/2018). Leaves opposite lance-shaped, basal leaves numerous, stem leaves 5-10 pairs, 3-8 cm long, 0.2-0.8 cm wide, stalkless, base clasping stem, finely hairy. Dianthus armeria flowers. 2003 © Peter M. Dziuk. Minnesota Wildflowers. minnesotawildflowers.info (Accessed 2/2018). Flowers dark pink, finely dotted with white, radially symmetrical, 5-parted, petals elliptic, 0.5 cm long, narrowed at base, margin toothed, calyx narrow, cylindrical, hairy, 1-2 cm long; inflorescence of 3-9 flowers, each above slender bracts often longer than flowers; blooms May-July. Dianthus armeria (Deptford pink) fruit. Karen Smith (Karen Goatkeeper.” jpeg (Accessed 2/2018). 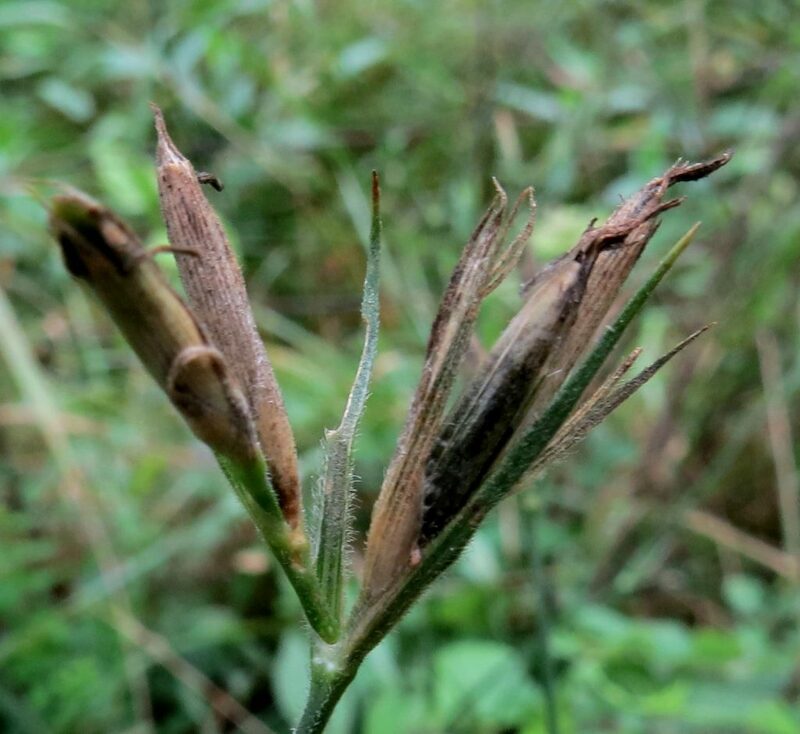 Fruit dry, narrow capsule 1-2 cm long, opening from top with 4 back-curved teeth, seeds black, flattened; winter plant with clusters of dry, open fruit capsules amid numerous thin bracts (Levine 1995). Habitat: Open areas, roadsides, fill, edges.